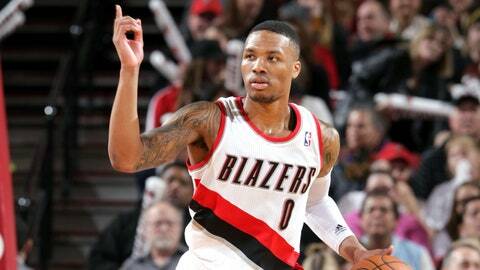 And that's a rap: Portland Trail Blazer Damian Lillard. Portland’s Damian Lillard has long posted 15-second raps on his Instagram account with the hashtag #4barfriday. The Trail Blazer also hosted a New Orleans #4barfriday rap battle during All-Star weekend in February. The 23-year-old Lillard recently told CSNNW.com he plans to release a mixtape later this year before dropping his first album. The point guard also felt his musical talent could match his NBA success. "If my profile continues to increase, I think I can go platinum with my music," Lillard revealed to CSNNW.com. "Not to knock anybody else who has done it, but I can actually rap. I have a story to tell. It’s not going to just be about basketball. I have more content than that. With the way I know I can get down, and the producers that I’ll align myself with, there’s no reason not to think I couldn’t go platinum." You can't. They are one of a kind customs by @redribbonrecon RT @Blazer_Aguirre3: I'm gonna try to buy @Dame_Lillard #4BarFriday new shoes. Maybe these rhymes are so raw they’re not meant for public consumption.